The Missouri Southern Athletic Department will induct two individuals and one team as part of its 2018 Hall of Fame Weekend on October 20 this fall. The list includes a football player, a women’s track and field athlete and a team. The newest class will be present at a social Friday evening and will be inducted at a brunch on Saturday. The group will be introduced as new Hall of Fame members at halftime of the Lions’ football game vs. Northeastern State that Saturday. The lunch is open to the public. Registration and a social will take place from 11 am to 11:30 am on Saturday morning in the Academic Center inside the North Endzone Facility. The presentation and lunch will begin at 11:30 am and go to just before noon, with the induction speeches beginning at 11:50 am. Fans wishing to attend need to RSVP to the athletic department at 417-625-9317. Cost to attend the event is $15. 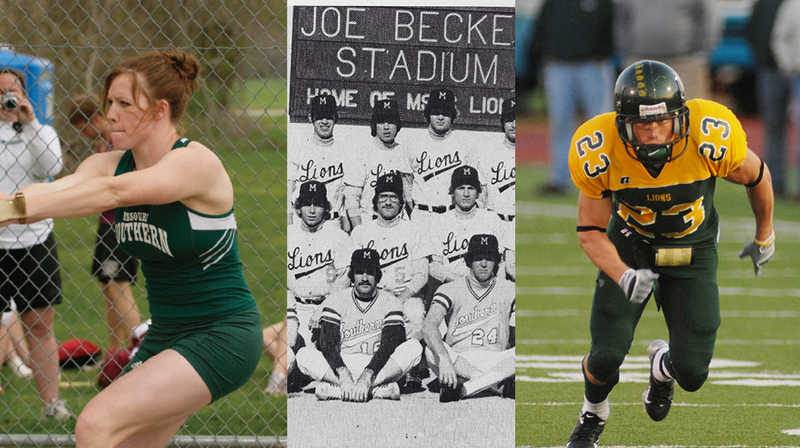 Colin Bado (Football 2004-2007), Jessica Selby-Tallman (2005-08) and the 1978 Baseball team will all join the Missouri Southern Athletics Hall of Fame as the 2018 Induction Class. Bado will go down as one of the greatest receivers in MSSU football history. He holds the MSSU record for career pass receptions with 250 and the next highest is 54 fewer. He ranks third in receiving yardage with 2,789 and has 16 career touchdowns. Bado holds the top two single-season reception marks in MSSU history (88 in 2006 and 84 in 2007) and three of the top five in a single season. Bado led all of Division II in 2006 with his 88 receptions that season, averaging 10.8 yards per catch. A three-time MIAA Academic Honor Roll selection and two-time All-MIAA selection, Bado served as a team captain and was a 2007 CoSIDA Academic All-District pick. He graduated from MSSU in 2007 with a degree in marketing and currently serves a teacher and track and field/football coach in Texas. The most decorated female thrower in MSSU history, Jessica Selby-Tallman was an eight-time NCAA Division II All-American and finished her career with a National Championship in the hammer throw in 2008. She was twice a national runner-up in the shot put. Selby-Tallman dominated the MIAA in the throws, winning four outdoor MIAA shot put titles, four indoor MIAA indoor titles, three MIAA hammer throw titles, and one weight throw championship. She was a three-time MSSU Female Athlete of the Year winner and holds the school record for the indoor and outdoor shot put, as well as the hammer throw. She also owns the facility records for the indoor and outdoor shot put. Selby-Tallman was the USTFCCCA National Outdoor Field Scholar-Athlete of the year in 2008 and was a two-time Academic All-American. She was a finalist for the MIAA Ken B. Jones award in 2008 and earned multiple MIAA academic honors. Selby-Tallman graduated from MSSU in 2009 with a degree in communications and currently is a Chiropractor with First Choice Chiropractic in Overland Park, Kan. She and her husband, Jamie have three daughters, Josie, Julia and Janna. The 1978 MSSU baseball team had to overcome Mother Nature with 24 games rained out during the season and the Lions were just one game over .500 (15-14) at the conclusion of the regular-season, but that’s when the team heated up. Seeded fourth in the NAIA District 16 playoffs in Springfield, the Lions won the district with three-straight wins and went on to take three-straight in Wisconsin against Wisconsin-LaCrosse and Winona State to win the Area Championship and make it to the NAIA World Series. The Lions won three-straight over Emporia State, Lewis and Clark and Lipscomb to start the World Series, but fell to Emporia State in two-straight to finish as the National Runners-Up. At one point in the post season, the Lions won nine-straight games to put themselves in the National Championship game. Led by Hall of Fame coach Warren Turner and All-District players Greg Curran (2B), Red O’Dell (CF), Mike Allen (C), and pitcher Barry Jenkins, the Lions also placed O’Dell and Jenkins on the All-Area Tournament Team. Jenkins, Allen and Randy Cable were named to the All-National Tournament Team and Turner was named the NAIA Coach of the Year. With the addition of the 2018 class, the MSSU Athletics Hall of Fame now includes 123 members and three teams.